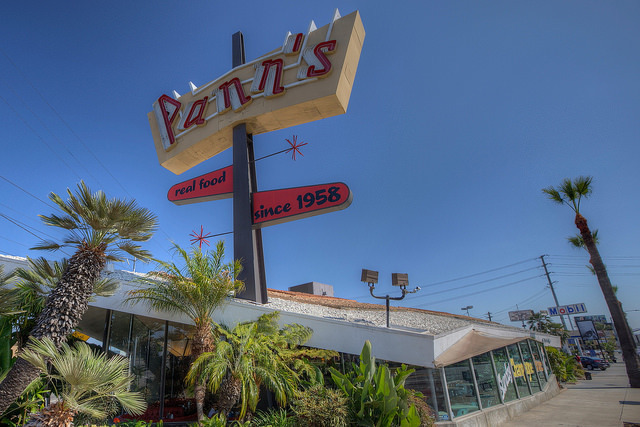 When it comes to coffeeshops, Pann&apos;s is as iconic as it gets. The diner opened in 1958 and has been dishing out their fried chicken and cajun andouille sausage for decades. It&apos;s also noted for its distinctive Googie-style architecture, and everyone from Vin Diesel to Nicolas Cage have filmed a movie there. In spite of all the years, Pann&apos;s will be undergoing some changes. As owner Jim Poulos told LAist, the restaurant is struggling to keep up with the new minimum wage hikes, and will have to shorten their hours to stay afloat. Starting August 1, the restaurant will be operating from 7 a.m. to 3 p.m., meaning it will be closed for dinner. Poulos adds that the details are still being ironed out, and that there may be modifications to the hours for one of the days. The dinner menu will be gone, of course. But Poulos says that, with the costs saved from not serving dinner, Pann&apos;s may look into "expanding with new items” and "passing on greater value for the breakfast and lunch menus." According to Poulos, the wage hike produces a domino effect that has significantly raised his cost of operations. "The cook who is already making $15 an hour is not going to like it that the dishwasher is making the same amount," said Poulos. He adds that his vendors have been rising their prices because of the wage hike. "It&apos;s been a huge hit. How else is the restaurant industry supposed to deal with it? There&apos;ll be more automation. They&apos;ll be cutting labor, cutting quality." Poulos adds that he is "making every attempt to keep every one of our evening staff," and is looking into giving them daytime hours. ...we can&apos;t just jack up prices and pass the additional cost along to customers. There are real limits to what people will pay. We can charge only so much for a shrimp tempura roll or a Kobe beef burger before our customers will start looking at other dining options.